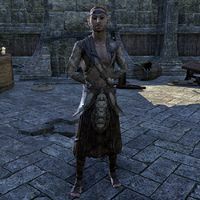 Spinner Maruin is a Bosmer spinner who initially occupies the Spinner's Cottage. After Throne of the Wilderking, he relocates to Greenheart. "Yes. Of course. I have been waiting for you for some time. The story needs you to play a part in the present ... and in the past." "As one story ends, another reaches its climax. Our little bit of mischief was a success: because of you, Aranias may very well betray her masters to defend the Wilderking. After the conclusion of this quest, he drops "Spinner" from his name, becoming simply Maruin, and relocates to the path just north of Greenheart. "The story of the Wilderking has come to an end, and the story of the Wilderqueen has begun. Few Bosmer realize how fragile their relationship with the Valenwood really is, but you and I know. We've seen the sacrifice required to preserve it." So the Valenwood is safe now? "Unfortunately, no. This Veiled Heritance seems set upon attacking the heart and soul of our people, and that is the Valenwood. I sense that even darker threats are emerging elsewhere. I hope you or someone like you is there to stand in our defense." Will Aranias forget her previous life entirely? "Over time, yes. The myriad of sensations and experiences from being connected with the Valenwood will crowd out the small memories from her past. The legacy of her character will remain, though, and will shape the future of the Valenwood." If spoken to after these quests, he will say "Truly, I hope we never need to change a story so extensively again. Though we spinners can do so, it's usually better to let a tale conclude on its own. This page was last modified on 5 August 2018, at 19:28.